Ah, the Fairy Tale Dress. You know, the one that you can take to full-on, fancy party mode (if you want to that is). It’s the ultimate dress for special occasions with two different Peter Pan collars (or it could be made collarless), two different waist bow options, with or without tulip cap sleeves, an invisible zipper, it’s fully lined, and it even has a crinoline, to boot! The Fairy Tale Dress is a more time-consuming pattern because of all the wonderful details, and we strongly recommend making a bodice muslin to ensure a good fit. This style is more fitted than our other styles. 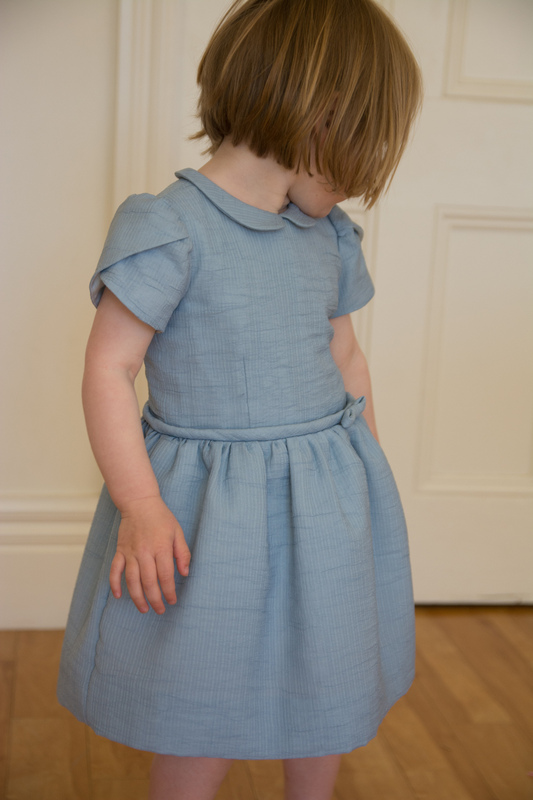 Also, if you are sewing this dress for a toddler, head over to the tutorial for fitting a Fairy Tale muslin for a toddler. Be sure to take your time with this one. You’ll be amazed at the end result. What have you got on your sewing list right now? 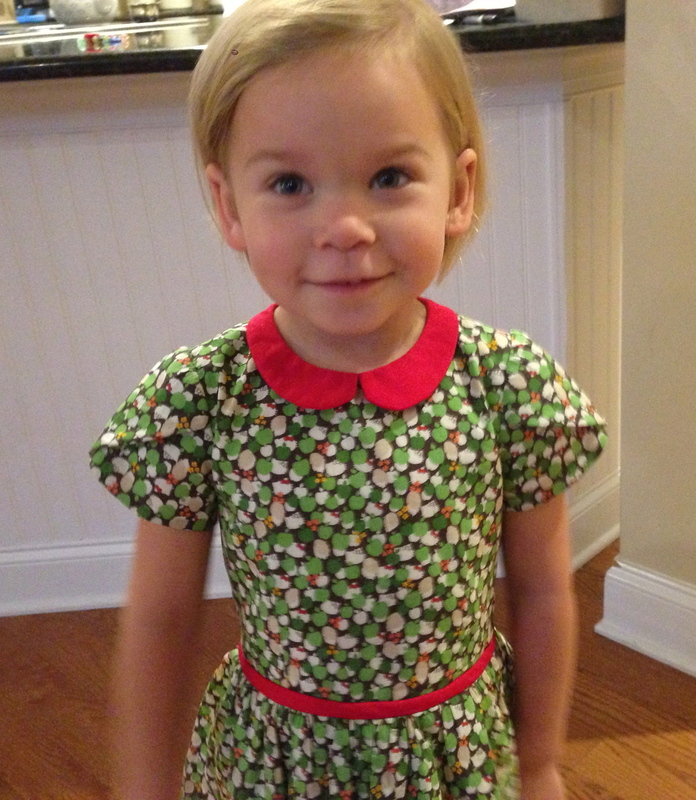 Do you have plans for sewing up a special dress for the holidays? 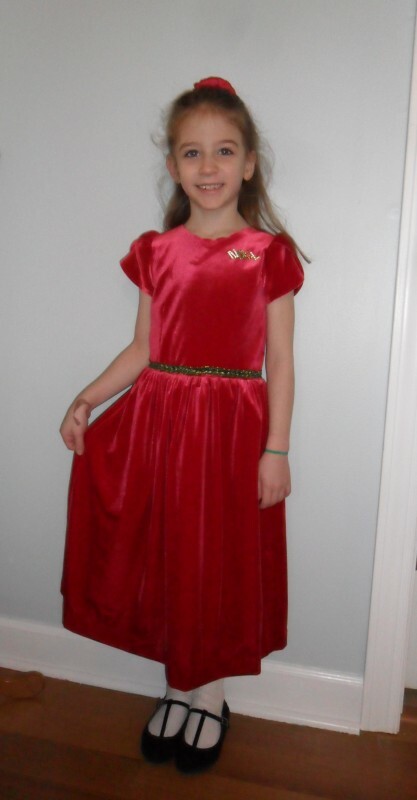 Enjoy these ideas for Fairy Tale Dresses for the holiday season. 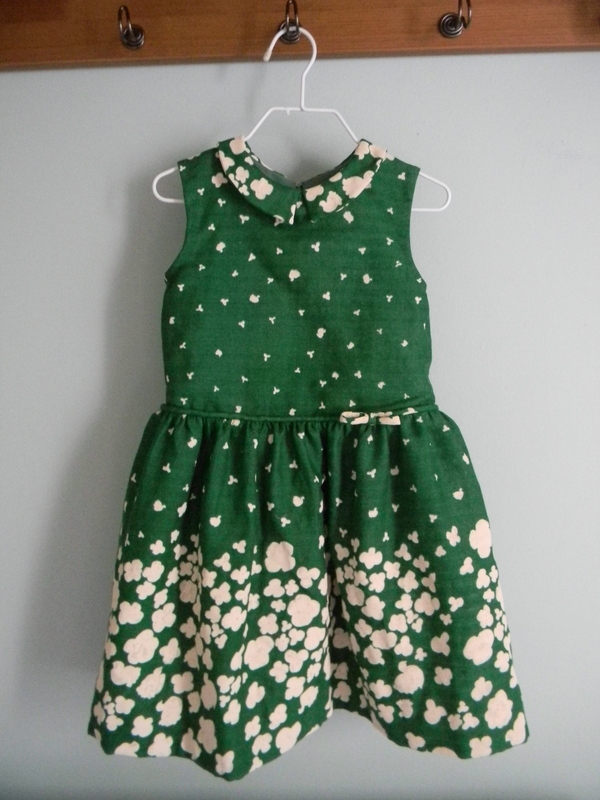 First up, we have Rita who sewed this green and gorgeous version with a Nani Iro double gauze border print. The wearer calls it her “popcorn dress” and in their household they have a Christmas tradition of stringing popcorn into a garland, so how perfect is that? Shelley made this lovely one in sheer blue/grey fabric underlined with cotton. 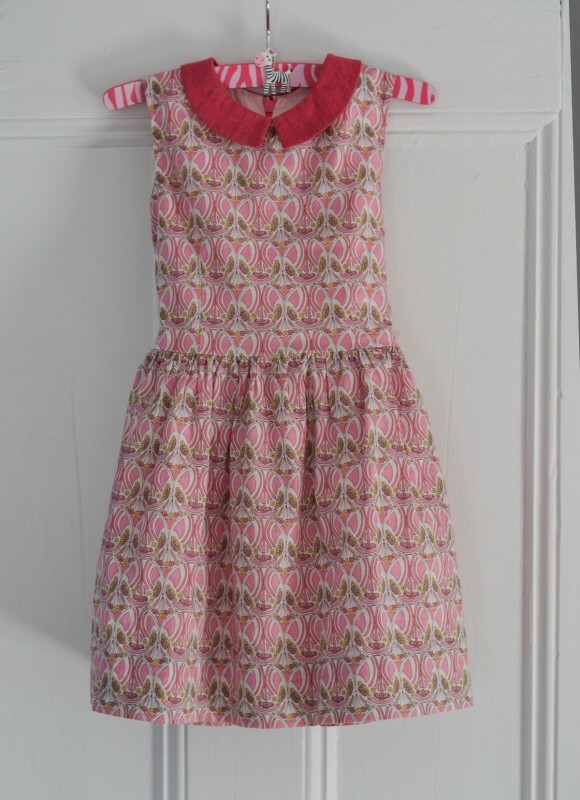 Here is a pretty one in pink by Kelly who used a Liberty print for the dress and shot cotton for the collar. 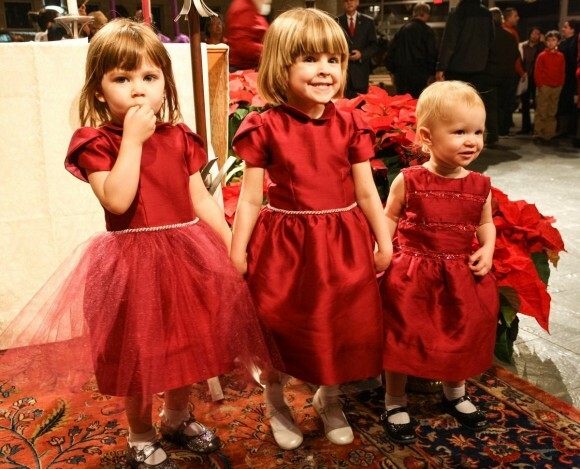 These two coordinated dresses were made for sisters in rich and vibrant colors. Marnae made the first one in a floral cotton poplin and the second one in a fuchsia faux dupioni silk. Next up, Deb changed it up a little by adding smocking to this red, white, and green snowflake version which already made an appearance in the smocked dress round-up. Jenny created this beautiful one in red velvet with added length and a (collarless) scalloped neckline. This cute version is by Alexandra who used a Liberty of London Hello Kitty with green apples print cotton lawn with red cotton trim. Lastly, Donna has made many Fairy Tale Dresses. Here there are three in a row! All in red. Each one unique. She also sewed these in: red cotton silk, merlot silk, and purple and wine dupioni silk. Instead of paying the giant prices in boutiques for a dress like these, you can make it yourself. Now go and grab some gorgeous fabric and get all fancy with it! 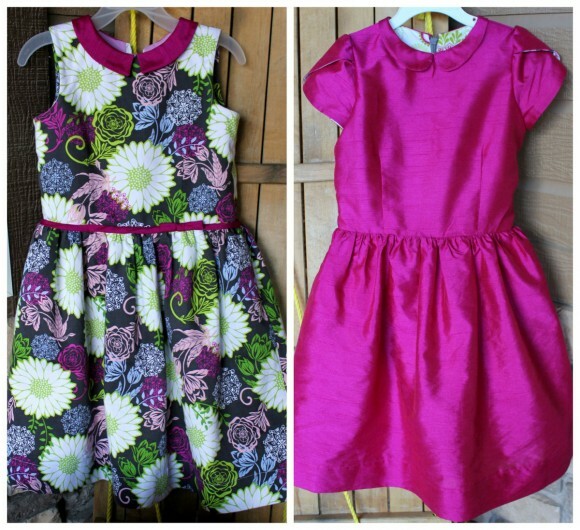 I look at these beautiful pictures and think, wow, we really made those dresses?! Amazing what you can do with a great pattern. These are darling! The piping really makes these prints Pop! 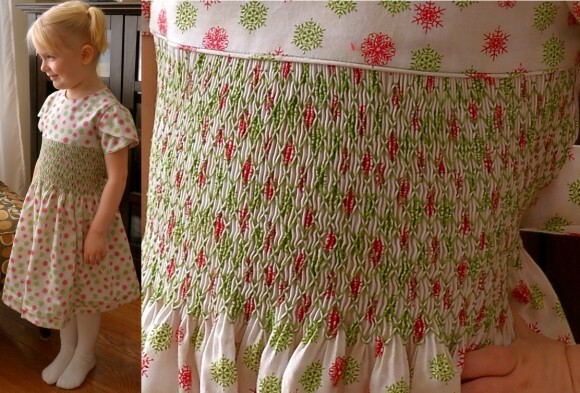 I do love the Fairytale Dress pattern! The one I made (designer cotton, silk for bow, collar and sleeve and skirt linings, and a very full tulle underskirt) got so many complements and wearings — it was her favorite dress for a long time and it was a sad day when it no longer zipped up. What an inspiring variety of fairy tale dresses. I’ll have to cut one out soon.